Summary. Aim: To investigate the content of essential elements (EE): copper, zinc, magnesium, iron and calcium and the evaluation of the activity of metal-containing enzymes — ceruloplasmin (CP), myeloperoxidase (MPO) and the content of transferrin (TF) in blood plasma (BP) and tumor tissue (TT) of animals with Walker-256 carcinosarcoma treated with lactoferrin (LF). Materials and Methods: The study of the EE content and the activity of the abovementioned enzymes was carried out on rats with Walker-256 carcinosarcoma treated with LF at the doses of 1 and 10 mg/kg of body weight. The quantitative content of EE in BP and TT of animals was determined using the inductively coupled plasma atomic emission spectroscopy (ICP-AES). Determination of CP activity, content of TF and hemochromes was performed using the method of electron paramagnetic resonance (EPR), and MPO — by unified biochemical method. Results: The introduction of LF at the doses of 1 and 10 mg/kg resulted in a decrease in the ratio of Cu/Zn in BP and even more expressed decrease of Ca/Mg ratio in TT. 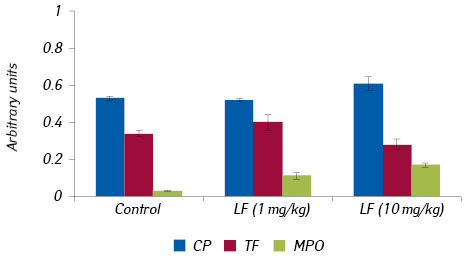 Administration of LF, especially at a dose of 10 mg/kg, affected the increase in CP and MPO activity in BP. It has been shown that administration of LF at a dose of 10 mg/kg led to an increase in oxidative products of destruction of the hemoglobin-hemochrom system in the TT, against the background of lowering the TF content. Conclusions: The administration of LF, especially at a dose of 10 mg/kg, led to metabolic alterations associated with inhibition of the tumor process. The detected modulating effect of LF on the content of the EE and the activity of the CP and MPO may be a basis for correction of the elemental balance in carcinogenesis. Abbreviations used: AOS — antioxidant system; BP — blood plasma; CP — ceruloplasmin; EE — essential elements; EPR — electron paramagnetic resonance; ICP-AES — inductively coupled plasma atomic emission spectroscopy; LF — lactoferrin; MPO — myeloperoxidase; TE — trace elements; TF — transferrin; TT — tumor tissue. Today the priority direction of modern oncology is the search for ways to improve the diagnosis, monitoring and individualization of the tactics of treatment for patients with malignant neoplasms. For this purpose, the whole complex of metabolic processes in the body of the tumor carrier which occur at the initial stages of the formation of the tumor process and the deve­lopment of the tumor, is thoroughly investigated [1, 2]. According to some authors, the violation of the homeostasis of essential elements (EE) in carcinogenesis is one of the primary components, which coordinates the work of most physiological systems involved in the development of the tumor [3, 4]. It is well-known that the ionic mechanism of biological processes regulation is genetically determined, and plays a significant role in the processes of cell growth, differentiation, reparation, apoptosis and necrosis, both in normal and in different pathological conditions [4–7]. It has been shown in various experimental models that magnesium, calcium, copper, zinc and iron ions play an important role in the regulation of metabolism and the repair of mitochondrial DNA, in the reprogramming of the catalytic activity of a number of enzymes, immune cells, hormones, and growth factors [8–13]. In addition, it has been found that iron is an important EE, which supports cell proliferation and is a key factor in cell survival in the microenvironment of the primary tumor and meta­stases . It is also known that the imbalance of the EE can affect the changes in the antioxidant-prooxidant status in the body, which in turn can act as an impetus for the initiation and development of malignant transformation. In modern studies, for the estimation of antagonistic and synergistic interaction between macro- and trace elements (TE) in carcinogenesis, there is a determination of not only their content, but also the ratio, the violation of which can serve as an initiating factor for the activation of the epithelial-mesenchymal transition, matrix metalloproteinases, a number of enzymes of antioxidant system (AOS) [14–18]. Attention is drawn to the fact that in the in vitro system the possibility of correction of TE content due to chelating agents has been proved, which in turn affects the change in the activity of metal-containing proteins [19, 20]. The above facts evidence that affecting ionic homeostasis could reload most regulatory systems. It is known that tumor progression is accompanied by activation of oxidative processes, which affects the change in the functioning of AOS enzymes [21–23]. In our previous studies in the in vitro system, the possibility of correction of pathophysiological processes through the use of an exo­genous form of the iron binding protein lactoferrin (LF) was shown . In our view, the correction of EE and metal-containing protein metabolism violations should be carried out by non-toxic factors of natural origin, which at the same time are characterized by antitumor and immunomodulatory properties, and this is confirmed by the data of own research [24, 25]. Unfortunately, today there is virtually no research on the possible simultaneous effects of factors with the above mentioned properties on EE homeostasis and the activity of AOS enzymes in patients with breast cancer. That is why we have chosen a polyfunctional protein — LF, which exerts antitumor activity, participates in the regulation of the immune response and at the same time is able to affect the balance of the TE, which in turn may affect the activity of metal enzymes — ceruloplasmin (CP), myeloperoxidase (MPO), and transporter of iron — transferrin (TF) [26–29]. It is shown that LF has a high affinity to the CP and MPO and is able to create complexes with them, which can also lead to changes in their functions . Thus, due to the ability of the LF to affect the elemental homeostasis, different conditions for the functioning of the CP and MPO can be created [16, 18, 28]. All this became the basis for studying the effect of LF on the content of the EE and activity of the above-mentioned proteins in the in vivo system. The aim of our work was to investigate the changes in the EE content: copper, zinc, magnesium, iron, and calcium ions in blood plasma (BP) and tumor tissue (TT) of animals with Walker-256 carcinosarcoma under the influence of LF with simultaneous evaluation of the activity of CP and MPO, and TF content. In the experiment, female inbred rats weighting 150–200 g bred in the vivarium of R.E. Kavetsky Institute of Experimental Pathology, Oncology and Radiobiology, NAS of Ukraine (Kyiv), were used. Animals were kept under standard conditions. All studies were carried out in accordance with the norms established by the Law of Ukraine “On the Protection of Animals from Cruel Treatment” and the requirements of the European Convention on the Protection of Vertebrate Animals (Strasbourg, 1986). Experimental animals are divided into three groups. The 1st group included intact animals, the 2nd (experimental group 1) — rats with transplanted Walker-256 carcinosarcoma, the 3rd (experimental group 2) — animals with transplanted Walker-256 carcinosarcoma, which were intraperitoneally injected with LF at a dose of 1 and 10 mg/kg body weight. The first administration of the LF was performed on the 3rd day after tumor transplantation, and the next 8 injections were performed daily. One day after the last injection (end of the exponential phase of tumor growth), the animals were withdrawn from the experiment. The doses of LF were selected due to the results of previous studies of the antitumor effect of this protein analyzed on the models of Ehrlich’s carcinoma and hepatoma 22a [30, 31]. All animals were withdrawn from the experiment by decapitation after the administration of the sedative agent. Determination of the EE content. The content of chemical elements in BP and TT of animals was determined using the method of the inductively coupled plasma atomic emission spectroscopy (ICP-AES) on the Ortima 2100 DV device from Perkin-Elmer (USA) . To determine the elemental composition: magnesium (Mg), calcium (Ca), zinc (Zn), iron (Fe), and copper (Cu) in the BP, we took 0.5 ml of sample, to which 4.5 ml of 10% HNO3 solution (Merck) was added and centrifuged for 20 min at 5000 rpm. To determine the EE composition in the TT, 0.1 g of sample were mixed with 3.0 ml of concentrated HNO3 (Merck) and mineralization was carried out in the Bergwoff MWS-2 microwave oven. Determination of iron content in BP of animals was performed using the automatic biochemical and immuno-enzyme analyzer Chem Well 2900 (USA). Determination of the content of CP, TF and hemochromes. The study of CP and TF content was performed in BP, while TP and hemohromes — in TT of animals using the electron paramagnetic resonance (EPR) at a temperature of liquid nitrogen of 77 °K (–198.8 °C). Trilon B was used as an anticoagulant . For this, 0.25 ml of serum or whole blood was frozen in special molds in liquid nitrogen. The EPR spectra for the CP are g = 2.05, for TF g = 4.25, and the hemochromes are g = 2.62. The level of active forms of CP and TF was determined by the intensity of EPR spectra of these proteins. The TF content was also determined in the TT of Walker-256 carcinosarcoma. To do this, 0.5 g of TT were placed in special molds and frozen in liquid nitrogen. All samples were examined using a computerized spectrometer R-1307 with H011 resonator (Russia). The power of the source of ultrahigh-frequency radiation was 40 mW, the modulation frequency was 100 kHz and the amplitude 10 Gs, the receiver’s constant time τ = 0.3 s. The activities and content of metal-containing proteins are given in standard units (USD) according to the internal standard of EPR (single crystal of ruby (Al2O3) with low content of Cr3+ ions). Error of the method of integrating the spectra of one sample was not more than 3%. According to EPR data, the LF used in the experiment did not contain bound (paramagnetic) iron ions. The study of the MPO activity of the BP was made according to the method . 100 μl of BP samples were mixed with 50 μl of potassium phosphate (K2HPO4) buffer, pH 7.4 and centrifuged at 15,000 × G for 15 min at 4 °C. Then, 10 volumes of 50 mM K2HPO4 buffer, pH 6.0, containing 0.5% hexadecyltrimethylammonium bromide (Fluka Chemie Buchs, Switzerland) were added and incubated at 60 °C for 2 h. Next, the samples were subjected to ultrasound treatment for 10 s, a three-fold freeze-thaw cycle, and a centrifugation procedure. To 100 μl aliquots of supernatant, 100 μl of o-dianisidine dihydrochloride (10 mg/ml in K2HPO4 buffer, Sigma-Aldrich Co.) and 0.3% Н2О2 were added. The optical density was measured at 405 nm for 1 min and norma­lized to the total protein content. Statistical analysis was performed using STATISTICA 6.0 software and the MS Excel 2010 application package. The significance of differences between the indices of different groups was estimated using Student’s t-criterion. The Pearson correlation coefficient was calculated. The differences were considered to be significant at p < 0.05. The main task of the first stage of the research was to determine the character of EE changes in the BP and TT of animals with Walker-256 carcinosarcoma due to the effect of exogenous LF at the doses of 1 and 10 mg/kg of body weight. Recent studies have found that the LF molecule has binding sites for a wide variety of cations (iron, copper, zinc) and anionic groups (sulfate, hydroxyl, nitrate, carboxyl). According to other data, this protein, depending on the structural spatial configuration and the degree of saturation with the trace elements, can bind these cations or be their donor [27, 35]. That is why, in our opinion, it was expedient to investigate changes in the EE content — iron, copper, zinc, magnesium and calcium in BP and TT of animals after the introduction of LF. First of all, the changes in iron content in BP and TT were analyzed, since LF has the highest affinity to Fe (Fig. 1). The results of our previous studies indicated that the iron content in the BP of animals with Guerin carcinoma was 1.5 times higher than that of intact animals . This is consistent with the literature data that iron deficiency in carcinogenesis may trigger the development of malignant neoplasms . It was shown that when LF was administered at the doses of 1 and 10 mg/kg there was a decrease in the iron content in BP and TT of animals with Walker-256 carcinosarcoma. It should be noted that its maximum reduction in the BP occurred at the LF dose of 10 mg/kg, while in TT, the content of this EE decreased by 1.7 times (p < 0.05) already at the LF dose of 1 mg/kg. These data allowed to conclude that a decrease in the iron content in TT due to LF action is the result of a natural correction of the balance of this TE in the tumor process. At the next stage, studies have also shown the changes in the content of copper, zinc, magnesium and calcium in TT and BP of experimental animals after the introduction of LF (Table). The data obtained indicated that the EE content in the BP of tumor carriers significantly differed from that in intact rats. Thus, the most pronounced changes were observed in the content of copper and zinc (an increase by 2 times, and decrease by 1.4 times, respectively, compared with intact animals (p < 0.05)). This fact may be due to the fact that the tumor during its development selectively requires an increase in the flow of copper for the activation of growth factors and AOS, while zinc reduction can be explained by its involvement in regulating the immune response [12, 18]. Note: *p < 0.05 — changes are significant compared to intact group and experimental group 1 values; **p < 0.05 — changes are significant compared to the values of the experimental group 1 and experimental group 2. It should be noted that the introduction of LF at a dose of 1 mg/kg did not affect the EE content in the BP of rats with Walker-256 carcinosarcoma compared with the experimental group 1. At the same time, administration of this dose of LF resulted in a significant decrease in calcium content in TT (p < 0.05). More pronounced changes in EE content in TT and BP of these animals were detected after LF administration at a dose of 10 mg/kg: in the BP the content of copper decreased by 2.2 times against the background of simultaneous 1.5-fold increase of zinc (p < 0.05). Along with this, in TT, a 2-fold decrease (compared with the experimental group 1) of calcium and magnesium was observed (p < 0.05). The obtained data demonstrated that LF at a dose of 10 mg/kg exerted a more pronounced effect on the homeostasis of EE than at a lower dose (Table). It is proved that in order to assess the balance of macro- and microelements and their interaction in an organism it is necessary to determine not only their content, but also the correlation between them, as it enables to reveal certain links of molecular-biological and metabolic disorders in the system “tumor-organism”. Thus, it has been shown that an increase in Cu/Zn ratio in TT and serum of patients with hormone-dependent tumors evidenced on activation of matrix metalloproteinases that are involved in the processes of invasion and metastasis [18, 21]. Along with this, it was found that the change in Cu/Zn ratio may be due to the disruption of the activity of some enzymes of the AOS [21, 37, 38]. It is also noteworthy that the formation of an invasive phenotype of tumor cells in breast cancer is accompanied by an increase of Cu/Mg ratio in the serum of these patients. These changes evidence on activation of the calcium-dependent pathway of the epithelial-mesenchymal transition through transient receptor potential-melastatin-like (TRPM7) . Therefore, we have analyzed the ratio of Cu/Zn and Ca/Mg in BP and TT of animals with Walker-256 carcinosarcoma after treatment with LF (Fig. 2, 3). 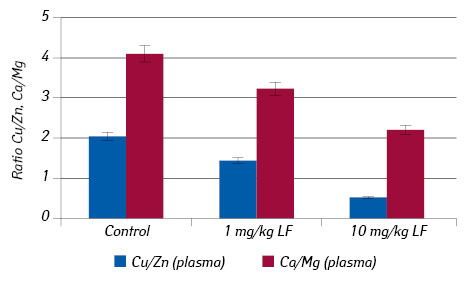 It was found that in the presence of LF at both doses, in the BP of animals from experimental group 2, the ratio of Cu/Zn and Ca/Mg decreased compared to experimental group 1. It was shown that in BP, LF at a dose of 10 mg/kg affected the Cu/Zn imba­lance more significantly than on Ca/Mg ratio (Fig. 2). Similar changes in Cu/Zn and Ca/Mg ratios were detected in Walker-256 carcinosarcoma cells after LF exposure in the above-mentioned doses (Fig. 3). In addition, it was found that the effect of LF in a dose of 10 mg/kg was accompanied by a decrease in the Cu/Zn ratio by 1.1 times, and Ca/Mg ratio — by 1.3 times in TT in comparison with these at lower LF dose (Fig. 3). Attention is drawn to the fact that the LF at a dose of 10 mg/kg changed the Cu/Zn ratio in the BP to a greater extent, whereas in the TT the effect was more pronounced for the Cu/Mg ratio. These data do not contradict the results of studies by other authors who believe that changes in Cu/Mg ratios in TT can be associated with blockages of the epithelial-mesenchymal transition, while Cu/Zn ratio in the BP indicates a change in the activity of some metal-containing antioxidant enzymes . Taking into account the above, it was reasonable to analyze not only the regulatory effect of LF on the balance of the EE in the tumor-organism system, but also to investigate the change in the activity of the prooxidant and antioxidant enzymes that have the highest affinity for it, namely, CP and MPO . There are numerous reports about the changes in the activity of these enzymes in various pathological conditions, but unfortunately, the mechanisms of their violations in carcinogenesis are not finally clarified. It has been established that the development of malignant neoplasms is associated with a decrease in the activity of the CP in the blood, which may well be due to a change in the exchange of copper in the body of the tumor-bearing organism. Change of the functioning of the CP in the tumor process, in turn, promotes the ele­vation of the content of free iron in the tissues, which initiates oxidative stress and promotes tumor progression. Despite the fact that the researchers’ opinions regarding the role of MPO in the pathogenesis of malignant neoplasms have been conflicting, also there have recently been publications about the increased risk of myeloproliferative neoplasia in patients with hereditary deficiency of MPO. It is known that products that are catalyzed by this endogenous peroxidase are strong oxidizing agents, among which, in particular, hypochlorite ions, reactive nitrogen derivatives and free radicals. The latter initiate lipid peroxidation and cause modification of proteins, including halogenation, nitration, oxidation and cross-linking, which ultimately can initiate tumor progression [40, 41]. Thus, the question about the role of CP and MPO in the emergence and development of neoplasia remains open, since these enzymes, on the one hand, are considered as active participants in the antioxidant defense of the organism from the destructive effects of free radical compounds, and on the other hand, they are able to initiate it. Therefore, there is no doubt that the correction of the functions of these enzymes can become a priority area in the development of therapeutic tactics for cancer patients. It is reasonable to carry out such studies in conjunction with the assessment of changes in the TF content, since along with the transport of iron in the body, it affects the activity of the CP and MPO . That was the impetus for determining the changes in the activity of these proteins, and TF in the BP under the conditions of exogenous LF administration. It should be emphasized that in the study of the activity of CP, MPO and TF in the BP under the influence of LF, the latter caused significant changes only at a high dose, the similar effect was observed regarding the ratio of the EE (Fig. 4). We believe that the introduction of LF may affect the activity of the CP and MPO due to complex alterations in the functions of these enzymes. So, it is po­ssible that LF, which is an alkaline protein (pH = 8.7), is capable of initiating peroxidase activity of MPO and, at the same time, not catalyzing the formation of hypochlorite anion. It is believed that the change in the activity of the MPO due to its interaction with the LF is important, since in the body of a tumor carrier there could be created conditions that counteract the additional halogenating stress [28, 42, 43]. In parallel with the changes in the activity of the CP and MPO, a decrease in the content of iron ions and TF in the BP of these animals was revealed, indicating the sy­nergy of interactions between them (Fig. 4). As shown in our previous studies, the effect of LF may influence the change in the content of total iron in the BP without affecting the level of hemoglobin [44, 45]. It should be added that LF, which partially or completely did not contain iron ions, could not bind to erythrocyte receptors and does not destruct hemoglobin. On the contrary, LF with a high degree of iron saturation initiated the destruction of hemoglobin. Unfortunately, there are no reports regarding possible changes in iron metabolism and oxidative damage of hemoglobin in TT under conditions of exogenous LF administration. To this end, we analyzed the content of end products of oxidative damage of hemoglobin — hemochromes, and TF content in Walker-256 carcinosarcoma under the action of LF at the doses of 1 and 10 mg/kg (Fig. 5). According to the obtained data, it was found that in the experimental animals treated with LF, especially at high dose, there was a tendency for decreased TF content against the background of simultaneous increase of hemochromes. 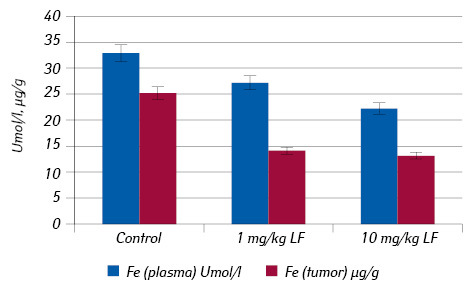 We have made the assumption about activation of the generation of free radicals in carcinosarcoma cells with high content of iron and copper, which is a favorable condition for the action of LF as a damaging factor for the integrity of membranes of red blood cells. In turn, such conditions trigger an increase in products of oxidative damage of hemoglobin. Thus, the testing of different doses of exogenous LF in relation to its effects on the content of TE and the activity of enzymes in TT and BP, showed that the most effective dose of this metal-containing protein is 10 mg/kg. The obtained results evidence that the introduction of exogenous LF leads to reorganization in various links of metabolic processes, which are associated with inhibition of the growth of malignant tumors, reduction of the effects of oxidative stress, and activation of autooxidation processes. The detected modulating effect of LF on mineral homeostasis and the activity of the above-mentioned enzymes may be a grounded basis for correction of the prooxidant-antioxidant ba­lance in the development of the tumor process. For experimental studies, recombinant human LF was kindly provided by professor, MD Y.V. Zalutskyi and his colleagues from the State Scientific Institution “Institute of Physiology of the National Academy of Sciences of Belarus” in accordance with the program of the joint research of the National Academy of Sciences of Ukraine and the National Academy of Sciences of Belarus (contract No. 07-04-15 “Molecular Biological Effects and Mechanisms of Action of Lactoferrin on Tumor Cells in the In Vitro and In Vivo System”). The work was carried out with the support of the Research Program of the Scientific Research Program of the National Aca­demy of Sciences of Ukraine “Molecular Genetic and Biochemical Mechanisms for the Regulation of Cell and Systemic Interactions under Physiological and Pathological Conditions” (2017–2021) within the framework of the research work “Molecular Biological Factors of the Heterogeneity of the Malignant Cells and the Variability of the Clinical Course of Hormone Dependent Tumors” (2.2.5.411, 0117U002034) and the departmental order “The Role of Lactoferrin in the Initiation and Progression of the Most Common Hormone-Dependent Malignant Neoplasms” (2.2.5.401, 2016-2018, 0115U005381). Duffy MJ, Harbeck N, Nap M, et al. Clinical use of biomarkers in breast cancer: Updated guidelines from the European Group on Tumor Markers (EGTM). Eur J Cancer 2017; 75: 284–8. Tao Z, Shi A, Lu C, et al. Breast cancer: epidemiology and etiology. Cell Biochem Biophys 2015; 72: 333–8. Tillashaykhov MN, Khudaykulov AT, Danilova EA, et al. Study of trace elements status of breast cancer patients. Оncology 2017; 19: 25–8 (in Ukrainian). Turski ML, Thiele DJ. New roles for copper metabolism in cell proliferation, signaling, and disease. J Biol Chem 2009; 284: 717–21. Formigari A, Gregianin E, Irato P. The effect of zinc and the role of p53 in copper-induced cellular stress responses. J Appl Toxicol 2013; 33: 527–36. Yu Y, Kovacevic Z, Richardson R. Tuning cell cycle regulation with an iron key. Cell Cycle 2007; 6: 1982–94. Hentze MW, Muckenthaler MU, Galy B, et al. Two to tango: regulation of mammalian iron metabolism. Cell 2010; 142: 24–38. Ishida S, Andreux P, Poitry-Yamate C, et al. 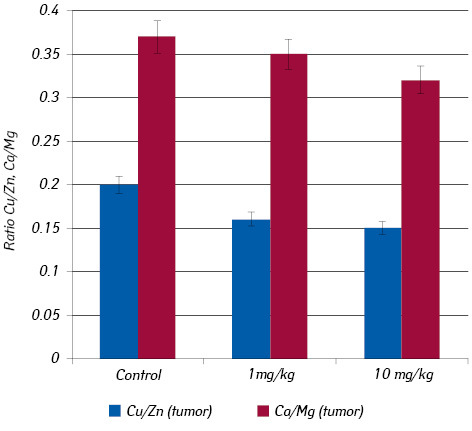 Bioavailable copper modulates oxidative phosphorylation and growth of tumors. Proc Natl Acad Sci USA 2013; 110: 19507–12. Wolf FI, Cittadini AR, Maier JA. Magnesium and tumors: Ally or foe? Cancer Treat Rev 2009; 35: 378–82. Beguin Y, Aapro M, Ludwig H, et al. Epidemiological and nonclinical studies investigating effect of iron in carcinogenesis — a critical review. Crit Rev Oncol Hematol 2014; 89: 1–15. Lansu K, Gentile S. Potassium channel activation inhibits proliferation of breast cancer cells by activating a senescence program. Cell Death Dis 2013; 4: e652. Rigiracciolo DC, Scarpelli A, Lappano R, et al. Copper activates HIF-1α/GPER/VEGF signalling in cancer cells. Oncotarget 2015; 6: 34158–77. Qian Y, Yin C, ChenY, et al. Estrogen contributes to regulating iron metabolism through governing ferroportin signaling via an estrogen response element. Cell Signal 2015; 27: 934–42. Mendes PMV, Bezerra DLC, Dos Santos LR, et al. Magnesium in breast cancer: what is its influence on the progression of this disease? Biol Trace Elem Res 2018; 184: 334–9. Sahmoun AE, Singh BB. Does a higher ratio of serum calcium to magnesium increase the risk for postmenopausal breast cancer? Med Hypotheses 2010; 75: 315–8. Lee CM, Lo HW, Shao RP, et al. Selective activation of ceruloplasmin promoter in ovarian tumors: potential use for gene therapy. Cancer Res 2004; 64: 1788–93. Pradhan A, Herrero-de-Dios C, Belmonte R, et al. Elevated catalase expression in a fungal pathogen is a double-edged sword of iron. PLoS Pathog 2017; 13: e1006405. Zabłocka-Słowińska K, Płaczkowska S, Prescha A, et al. Serum and whole blood Zn, Cu and Mn profiles and their relation to redox status in lung cancer patients. J Trace Elem Med Biol 2018; 45: 78–84. Antoniades V, Sioga A, Dietrich EM, at al. Is copper chelation an effective anti-angiogenic strategy for cancer treatment? Med Hypotheses 2013; 81: 1159–63. Lane DJ, Mills TM, Shafie NH, et al. Expanding horizons in iron chelation and the treatment of cancer: Role of iron in the regulation of ER stress and the epithelial-mesenchymal transition. Biochim Biophys Acta 2014; 1845: 166–81. Blockhuys S, Wittung-Stafshede P. Roles of copper-binding proteins in breast cancer. Int J Mol Sci 2017; 18: e871. Goodman VL, Brewer GJ, Merajver SD. Copper deficiency as an anti-cancer strategy. Endocr Relat Cancer 2004; 11: 255–63. Tury S, Vacher S, Assayag F, Bonin F, et al. The iron chelator deferasirox synergises with chemotherapy to treat triple-negative breast cancers. J Pathol 2018; 246: 103–14. Chekhun VF, Storchay DM, Shvets YV, et al. Cytotoxic effects of exogenous lactoferrin on breast cancer cells with different degree of malignancy in vitro. Exp Oncol 2016; 38: 131. Chekhun VF, Storchay DM, Todor IN, et al. Antitumor and genotoxic effects of lactoferrin in Walker-256 tumor-bearing rats. Exp Oncol 2018; 40: 200–4. Fernández-Menéndez S, Fernández-Sánchez ML, González-Iglesias H, et al. Iron bioavailability from supplemented formula milk: effect of lactoferrin addition. Eur J Nutr 2017; 56: 2611–20. Baker EN, Anderson BF, Baker HM, et al. Metal and anion bindings sites in lactoferrin and related proteins. Pure Appl Chem 1990; 62: 1067–70. Sokolov AV, Zakahrova ET, Kostevich VA, et аl. Lactoferrin, myeloperoxidase, and ceruloplasmin: complementary gearwheels cranking physiological and pathological processes. BioMetals 2014; 27: 815–28. Recalcati S, Minotti G, Cao G. Iron regulatory proteins: from molecular mechanisms to drug development. Antioxid Redox Signal 2010; 13: 1593–616. Terpinskaya TI, Pavlovets LV. The effect of human lactoferrin obtained from the milk of transgenic goats on the growth of transplantable tumors in mice Healthcare. Minsk (Belarus) 2013; 2: 33–7. Zalutsky IW, Lukashevich VS, Lukyanova NYu, et al. Effect of exogenous lactoferrin on the development of an experimental model of breast carcinoma. Rep NAS of Belarus 2017; 61: 103–8. Andrusishina IM, Lampeka OG, Golub IO, et al. Estimation of the damage to the professional community in professional contingents for the additional method of atomic energy spectroscopy from inductively coupled plasma. UkrTsNMI and the PCR of the registry No. 72-K: Avitsen 2014: 60 (in Ukrainian). Burlaka AP, Sydorik EP. Radical forms of acid and nitrogen oxides during the fat process. K: Naukova Dumka, 2006. 228 p. (in Ukrainian). Schierwagen C., Bylund-Fellenius AC, Lundberg C. Improved method for quantification of tissue PMN accumulation measured by myeloperoxidase activity. J Pharmacol Methods 1990; 23: 179–86. Masson PL, Heremans JF. Metal-combining properties of human lactoferrin (red milk protein). The involvement of bicarbonate in the reaction. Eur J Biochem 1968; 6: 579–84. Chekhun VF, Lozovska YuV, Burlaka AP, et аl. Peculiarities of antioxidant system and iron metabolism in organism during development of tumor resistance to cisplatin. Exp Oncol 2014; 36: 196–201. Rodrigues GP, Cozzolino SMF, Marreiro DDN, et al. Mineral status and superoxide dismutase enzyme activity in Alzheimer’s disease. J Trace Elem Med Biol 2017; 44: 83–7. Krzyminiewski R, Dobosz B, Kubiak T. The influence of radiotherapy on ceruloplasmin and transferrin in whole blood of breast cancer patients. Radiat Environ Biophys 2017; 56: 345–52. Kim SW, Lee YJ, Chung JW, et al. A higher ratio of serum calcium to magnesium is associated with aggressive clinicopathological characteristics in the patients who underwent radical prostatectomy. Korean J Urol Oncol 2018; 16: 25–31. Ambrosone СВ, Barlow WE, Reynolds W. Myeloperoxidase genotypes and enhanced efficacy of chemotherapy for early-stage breast cancer in SWOG-8897. J Clin Oncol 2009; 27: 4973–9. Rymaszewski AL, Tate E, Yimbesalu JP. The role of neutrophil myeloperoxidase in models of lung tumor development. Cancers (Basel) 2014; 6: 1111–27. Castillo-Tong DC, Pils D, Heinze G, et al. Association of myeloperoxidase with ovarian cancer. Tumour Biol 2014; 1: 141–8. Däster S, Eppenberger-Castori S, Hir C, et al. Absence of myeloperoxidase and CD8 positive cells in colorectal cancer infiltrates identifies patients with severe prognosis. Oncoimmunology 2015; 4: e1050574. Maneva A, Taleva B, Manevab L. Lactoferrin-protector against oxidative stress and regulator of glycolysis in human erythrocytes. Z Naturforsch 2003; 58: 256–62. Vercellotti GM, van Asbeck BS, Jacob HS. Oxygen radical-induced erythrocyte hemolysis by neutrophils critical role of iron and lactoferrin. J Clin Inv 1985; 76: 956–62.